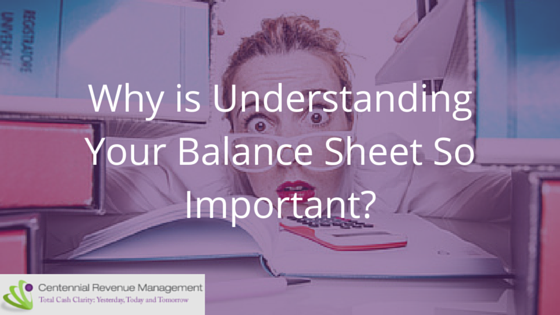 Why is Understanding Your Balance Sheet So Important? The Balance Sheet is often one of the most overlooked financial statements. Why is that? Most business owners trust their financials to their bookkeeper and their CPA. If you are reviewing your financials on a monthly basis, are you only looking at your Profit and Loss/ Income Statement? Is your bookkeeper printing a Balance Sheet on a monthly basis? To optimize Cash Flow, it’s important to look at your Profit and Loss (P&L), Balance Sheet, Accounts Receivable Report (A/R), and Accounts Payable Report (A/P) each month. Here, we are going to focus on the Balance Sheet. This is the financial statement that is a summary of what the business assets, liabilities, and owner’s equity are. From the day the business was started, the Balance Sheet has recorded the ending balances of each of these categories. Whereas the Profit and Loss records the day to day revenue and expense transactions, the Balance Sheet is a snapshot showing only the ENDING BALANCE at a particular moment in time. It may sound boring to be looking at this financial statement because what is the value of looking at the ending balances on a weekly or monthly basis? Just wait, it gets exciting! The most important asset to be watching on your Balance Sheet is what your bank account ending balances are. This is where you will see how much money you have once all your checks and deposits clear the bank. It is an accurate balance to start with when looking at cash flow or paying bills. It will be different than looking at your bank account balances online. – Assets: If you purchase an asset (computer, furniture, etc. ), the amount paid is posted to the Balance Sheet-not the P&L. That is CASH that is not being watched on the P&L. – Liabilities: If you are servicing debt (credit cards, loans), the principal portion of the payment is posted to the Balance Sheet-not the P&L. That is CASH that is not being watched on the P&L. – Equity: If you are paying Owner’s Distributions/Dividends, these payments are posted to the Balance Sheet-not the P&L. That is CASH that is not being watched on the P&L. Be sure that your Balance Sheet “ending date” matches that of the P&L for which you are reviewing. – Print your Balance Sheet on an Accrual Basis (instead of a Cash Basis) so that you can see the A/R Balances (money coming in) and A/P Balances (money going out/bills that need to be paid). – Customize your Balance Sheet by adding a column showing a comparison of the month or year prior, and then a 3rd column showing the dollar ($) difference. This is where the DIRTY LITTLE SECRET is! You will see how much cash is posted to the Balance Sheet on a monthly or annual basis that is NOT posted to the P&L! My secret to optimizing Cash Flow is to know how much money, on a monthly basis, is posted to the Balance Sheet. Want to know more? Give me a call.